You are what you eat. Do you eat where you are? Sometime before dawn on Wednesday, September 2, 2015, a quarantine went into effect in a 85 square mile area of the Redland housing packing houses, tropical fruit groves, vegetable fields, fruit stands, plant nurseries, and homes. The quarantine is serious business, and a multi-million dollar agricultural industry is at stake. Tens of thousands of traps lie waiting throughout Florida at any given time with the sole purpose of alerting the Florida Department of Agriculture and Consumer Services (FDACS) to the presence of the Oriental Fruit fly and other invasive and destructive species of fruit flies. The FDACS website lists seven previous oriental fruit fly finds and subsequent eradications in Florida. 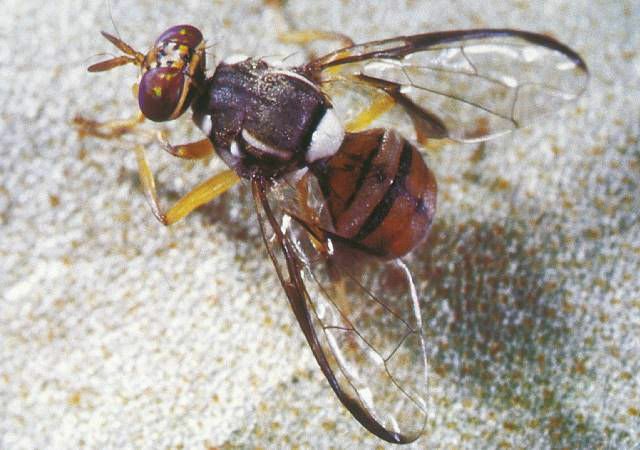 The Oriental fruit fly, Bactrocera dorsalis, is taken extremely seriously because the species has massive host list of 435 plants; they are the strongest fliers of all the fruit flies, and one female fly lays an average of 600 eggs in 30 days. According to Mark Fagan, the public information specialist of the Division of Plant Industry, a specialized division within FDACS, 30% of females can push out a whopping 50 eggs in a single day, or 1,500 eggs in 30 days. Females lay their eggs in host fruit or vegetables, then the young hatch and feed on the fruit, effectively making the fruit impossible to sell and unpalatable. The larvae then enter the soil below them, pupate, and emerge as flies to begin the cycle yet again. This fly has the power to completely devastate the multi-million dollar agricultural industry in South Florida and trigger regulations that would cripple the industry and put thousands upon thousands of jobs in jeopardy. Past finds of the Oriental fruit fly did not trigger quarantines because the number of flies was minimal with the previous high being 12 males and 4 females found in Tampa in 1999. The Redland invasion of 2015 was markedly different because of the extraordinary quantity of flies captured. After finding a lone male fly in a trap on August 17, outside of the quarantine area, FDACS later found an immediately alarming 45 male flies in a single trap on August 28. The historic 45 fly find was located in the heart of our agricultural industry in South Florida. Male flies are the first to be captured because the traps use a pheromone that tricks the males into thinking he is near a receptive female. FDACS, the USDA, Miami-Dade County, UF/IFAS Extension, and the University of Florida’s Tropical Research and Education Center have worked together, and readily shared information and resources to educate all interested parties about the rules and effects of the quarantine. The response from the agricultural industry has been tremendous. The Miami-Dade Extension office has already hosted five workshops dedicated to educating the industry, with over 600 people in attendance that were there just so they could do the right thing and help to stop the fly from spreading. • A compliance agreement needs to be filled out and signed, in person, with FDACS regulatory staff for any fruit, vegetable growers, packers, or sellers/stands located within the quarantine area that wish to sell or move any of the 435 host plants, vegetables, or fruits during the quarantine. Parties outside of the quarantine area that want to move produce into the area to pack or sell, must also sign a compliance agreement. • Some nurseries within the quarantine area need to sign a compliance agreement. You can still buy plants from these nurseries as long as the grower has signed the agreement or is selling a product that is not regulated under the quarantine (soil, mulch, rocks, fish, wood products, or any plants that are not near or under a fruit fly host tree or have host fruit on the plant). • Homeowners located within the quarantine zone cannot move fruit or vegetables on the host list off of their property. They can grow and eat the produce at their home, but cannot, under any circumstance, move the produce off their property until the quarantine is lifted. • It is possible to sell and buy produce within the quarantine area if the vendor has signed a compliance agreement and is taking the proper precautions (covering produce with approved mesh, bags or cases). If in doubt, ask the vendor if they have signed a compliance agreement. • Homeowners and fruit and vegetable growers outside of the quarantine area, or not affected by the quarantine because their crop is not in season, do not have to, or need to, spray any additional pesticides, or bait spray. Baits and sprays are part of the compliance agreement, but do not affect others, especially homeowners, and are not needed or recommended. The rules and regulations regarding the quarantine are difficult to complete and understand, but they are necessary to stop the Oriental fruit fly from jumping out of the quarantine area and making life even harder, if not impossible, for the hardworking farmers and agricultural community of the Redland. These men and women are your neighbors and often visit my office completely drenched in sweat after working countless, difficult hours in the fields tending to their crops. The silver lining could be the fact that the trap and kill program designed for the Oriental fruit fly is, in the words of DPI’s Mark Fagan, “extraordinary”. FDACS men and women are working seven days a week to hang baited traps, strip trees of fruit in the “hot zone”, and to eradicate this destructive fly completely. This can all go away if the traps remain empty for two full life cycles of the fly. The lifecycle fluctuates based on climatic conditions with hotter temperatures producing lifecycles around 30 days and cooler temperatures pushing the cycle nearer to 45 days. If all goes well, the quarantine could be over by late November or early December. The Redland is an area unlike any other on the planet. It is home to an incredible array of tropical fruit and vegetables, with crops as well knows as avocados and squash, and as unique as sugar apples and winged beans. Vegetable fields and fruit groves are intermixed and produce crops side by side tended by people as varied and diverse as the very crops they grow. That one of a kind diversity could be lost if the Oriental fruit fly permanently sets up shop in the Redland, so let’s all work together to not let that happen. For the quarantine map, a list of the 435 host plants, a copy of the compliance agreement, and more information on the Oriental fruit fly, visit the Fresh From Florida website. Call the Fresh From Florida Helpline at 1-888-397-1517 to request to be visited to sign a compliance agreement. Contact Miami-Dade Extension Commercial Tropical Fruit Agent, Jeff Wasielewski, at 305-248-3311, ext. 227 for more information regarding the quarantine and the compliance agreement. Download the OFF Quarantine Map. Download the OFF Host list by scientific name. Indie filmmaker Maryam Henein is back in town with a free screening of her documentary Vanishing of the Bees, co-sponsored by Tropical Audubon Society and Slow Food Miami. Come see an award winning, informative, provocative, beautifully filmed documentary about the ongoing honeybee crisis. To sweeten the deal, farmer Margie Pikarsky of Bee Heaven Farm will present a honey tasting. True to the name of her farm, there are vibrant and healthy bees living on her property, and the hives are maintained and honey gathered by beekeeper Miguel Bode. (You may have met him at various events at Fairchild Tropical Botanic Garden.) At least two different kinds of honey — wildflower, and lychee and longan — are produced by the bees that call Bee Heaven their earthly home. Admission is free, but you have to RSVP to Tropical Audubon Society at events@tropicalaudubon.org. Bee there! A review of a previous screening back in May 2011 can be found here. Can’t make it to the screening? You can watch online pay per view, or purchase a copy of the DVD at the film’s web site. Miami-Dade food loves can sign up now to get a share of fresh-grown produce straight from local farms. Fall marks the beginning of the main growing season for farmers in deep South Miami-Dade County. It’s also a time when veggie-lovers can join a CSA, or Community Supported Agriculture program. CSA members pay in advance for fresh produce grown at local farms, explained Diane Diaz, who helps run Teena’s Pride CSA in Homestead. Members get a share of the CSA’s harvest, the size of which will depend in part on Mother Nature. “It’s kind of like buying stocks into the farm, and as long as we don’t have a hurricane or a freeze, then your stocks are secure,” she said. You will need the latest version of Flash Player to watch the video. 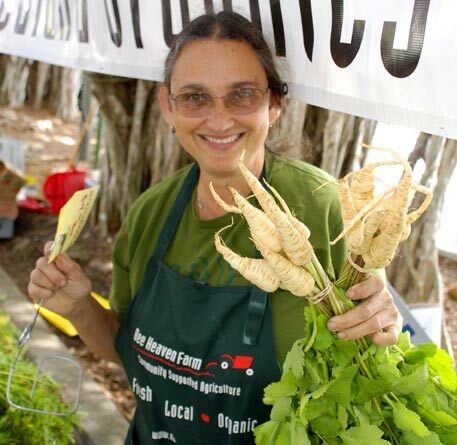 Margie Pikarsky with bunches of parsnips from Bee Heaven Farm. Activities at 6:00 p.m. Screening at 7:00 p.m.
Come make organic candied apples, enjoy organic popcorn and watch a film with the Director, Shelley Rogers and Character and Co-Producer, Marty Mesh! Community discussion will follow the screening. This event is a FUNdraiser for Florida Organic Growers (FOG). $20/person, kids under 12 enter free. Directed by Shelley Rogers, this film rings the alarm for the need to develop an ecological consciousness. The film illustrates that the organic food debate extends well beyond personal choice and into the realm of social responsibility. Each of the film’s characters is intimately connected to the organic world; they’re farmers, activists, and scientists. While many folks can easily endorse “organic,” the characters in the film take the discussion beyond just shopping for another eco-label. As we glimpse into each of their lives, we see how organic agriculture has the potential to solve many of our environmental and health problems. The film will explore how organic farming can be used as a soil and air protection system, a healthy solution to toxic pollution, and an innovative means to combat global warming. If you’re not able to travel, buy your own DVD here. Put the word out and host your own screening. Each copy comes with a public screening license, and the cost varies by the size of the audience. On occasion of of National Food Day (October 24), Youth L.E.A.D. and O Cinema present What’s on Your Plate? a critically acclaimed documentary that follows two eleven year old multi-racial city kids over the course of one year as they explore their place in the food chain, and shows their point of view on the growing local food movement in New York. The film will be shown on Saturday, Oct. 22, 2011 at 1 pm. From 11 am to 4 pm, Urban Oasis Project will have a farmer’s market set up, and the vegan food truck Mac’N will also be there. This screening is part of the Food Justice Film Series, which focuses on food justice and responsible eating through films, discussions, and food tastings given by local/organic producers. Sponsored by Slow Food Miami. Jim Ewing presents at GrowFest! How does the Oriental Fruit Fly Quarantine affect us?